The warm spring has brought out a few butterflies and bees and hoverflies and lots of new spiders creating webs too. 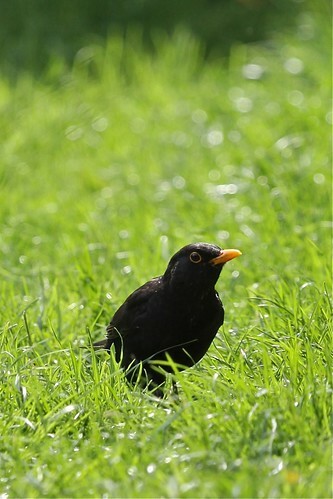 The birds are mostly paired up and busy rearing their young (especially with the blackbirds neatly stacking up mealworms in their beaks to take back to the nest). The Crow has begun to appear more regularly in the garden, he’s frightfully shy, as the garden isn’t too large and quite sheltered with trees and bushes inside, and he has to navigate carefully to make it down onto the grass. Thankfully the other birds are not to fearful of his presence, and can often be seen alongside the blackbirds and starlings feeding from the path.